2018 marks the fourth year of our Community Giving Project, allowing us to continue the tradition of giving back to San Diego. We love this project! San Diego Self Storage facilities span San Diego County from Carlsbad to Otay Mesa. The project launched with a goal to find a way for all of our locations to develop meaningful ties to their local communities. We give each site $500, which they may contribute to any organization they see fit. We contributed to a variety of philanthropies in 2017, with charities benefiting children and animals at the top of the list. Our teams have also chosen to help fight cancer, contribute to local history and humanitarian efforts, as well as with job training, arts programs, women’s safety and more. This year, Mira Mesa Self Storage has selected Boy Scout Troop 1203 as the recipient of their donation. The team at Mira Mesa Self Storage believes in the development of our youth and acquisition of skills to build confidence to mold their character and be future leaders of our community. The “Campership Fund” is an amazing program that will enable the development of Troop 1203’s young men, while offering a great experience with nature. Troop 1203 is in the Rancho Mesa District of the San Diego-Imperial Council in the Western Region of the Boy Scouts of America. Chartered by the Mira Mesa Moose Lodge, the troop is still growing in membership. Some of the member families struggle to meet the financial requirements of the programs. It is the hope of the team at Mira Mesa Self Storage that their $500 donation towards this program will help those families participate. 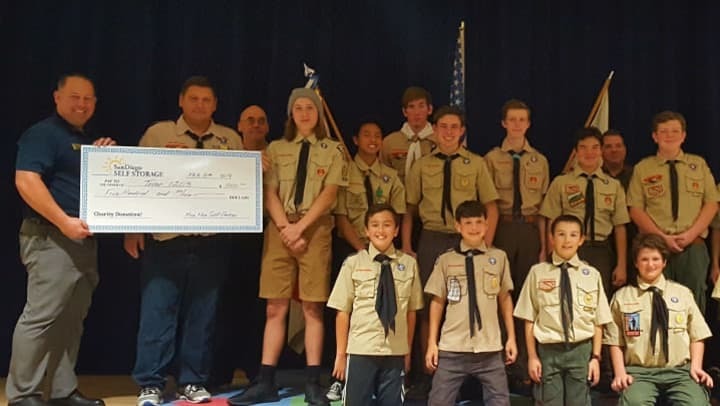 Helping to ensure that no scout members have to carry that burden, the donation allows these young men the opportunity to grow with their peers as they participate in the educational programs provided by Scout Troop 1203.